Slamming the final nail in the coffin of everything America used to stand for, the boot-licking U.S. Senate last night gave President Bush the legal authority to abduct and sexually mutilate American citizens and American children in the name of the war on terror. There is nothing in the “detainee” legislation that protects American citizens from being kidnapped by their own government and tortured. We have established that the bill allows the President to define American citizens as enemy combatants. Now let’s take it one step further. Before this article is dismissed as another extremist hyperbolic rant, please take a few minutes out of your day to check for yourself the claim that Bush now has not only the legal authority but the active blessings of his own advisors to torture American children. 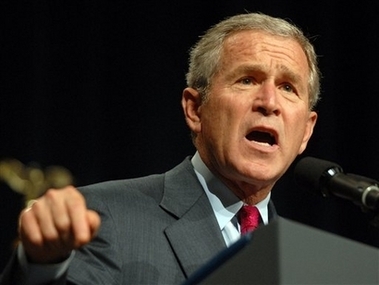 The backdrop of the Bush administration’s push to obliterate the Geneva Conventions was encapsulated by John “torture” Yoo, professor of law at Berkeley, co-author of the PATRIOT Act, author of torture memos and White House advisor. During a December 1st debate in Chicago with Notre Dame professor and international human rights scholar Doug Cassel, John Yoo gave the green light for the scope of torture to legally include sexual torture of infants.